Hello, this is Carlos, from the Eight engineering team. I joined Sansan about a year ago, and since I came here, I have been working on the Eight's feed team. What is Eight's feed you ask? Well, If you are a user of Eight, you probably know that when any important event regarding any of your contacts (switching companies or getting a promotion) you get that information delivered right to you. At Eight's feed team, we are working hard to make it happen, and we do hope you are happy with the news and the information we are delivering to you. In order to make this happen, there are lots of things happening in the background, some of them are really interesting if you are an engineer or if you like complex system with lots of moving pieces working together. When I joined this team, I didn't really know much about feeds or timelines, so this year has been a really interesting one since I got to learn a lot regarding this kind of things. That is why when my friend Paul McMahon, from Tokyo Rubyist Meetup group, told me that they were looking for speakers I decided to jump in and prepare a talk to share some of the points I have learned. 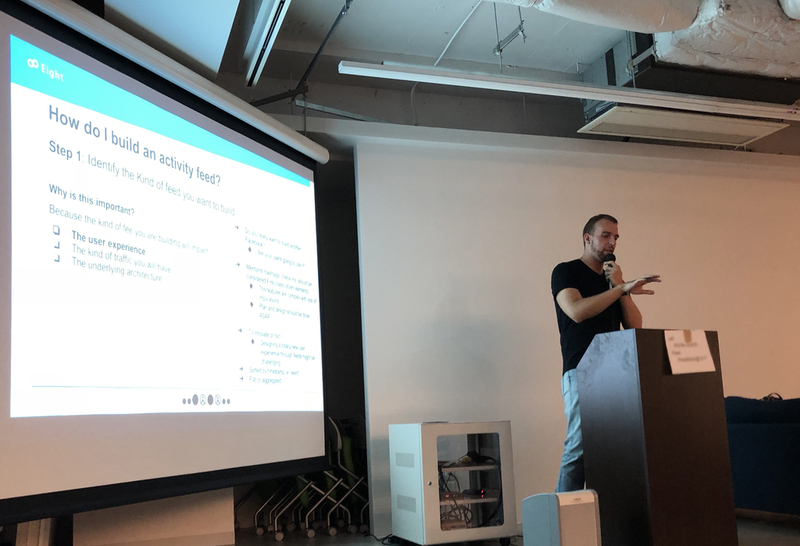 Sansan is really active in the different developers' communities in Tokyo. If you like Ruby, chances are that you have had heard about Omotesando.rb that sometimes is hosted on Sansan offices. But I felt that we were not active enough within the International community here in Tokyo, so I thought it would be a good chance to change that. I got the chance to speak for about 20 minutes about the basics of how to build timelines and some of the specifics about Eight's feed. There were some interesting questions and follow-up conversations, so on the overall, I think it went well. Currently, we are renewing some of Eight's feed architecture, so, who knows, maybe when the new feed is released and things settle down I will be talking again about the new feed. In the meantime, I'm going back to my terminal.